Lewis Hamilton and Nicki Minaj fuelled dating rumours as they made their second public appearance together in recent times. The Formula One superstar and the model-actor were first spotted hanging out together at the New York Fashion Week earlier this month. 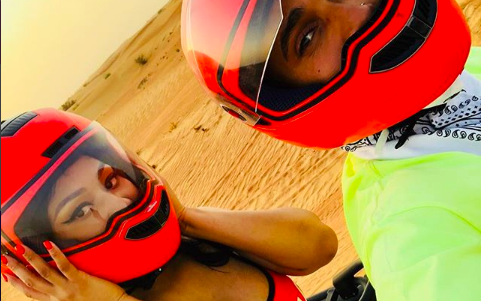 And now, the duo enjoyed a ride together on a quad bike on the sand dunes of Dubai ahead of this week’s Russian Grand Prix. Hamilton (33) and Minaj (35) later took to Instagram to share a couple of pictures from the outing with their legions of followers. While the former wore a casual green t-shirt and white shorts, the latter sported a daring Versace outfit as they both wore identical helmets. “Caribbean tingz what I on. Me & Lewis gettin paper like what ink dry on. #Versace,” Minaj wrote. Beginning of a new love story? We will know. ???????????????? Caribbean tingz what I on. Me & Lewis gettin paper like what ink dry on. #Versace ??? ?